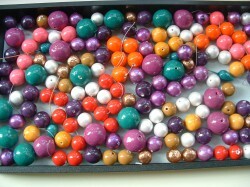 The colourful round things are vintage cotton pearls. I am so happy to have these in my collection. They are more intense in colour and are slightly irregular. Expect to see many pieces with these beauties. The next image shows prototypes of bracelets that I am working on. The clear pieces are acrylics which I will be including in my designs. These are fine quality and can hold their own with quartz. The advantage of course is that they are very much lighter and I am able to design jewellery that is dramatic and large but without the weight of stones. 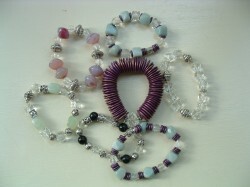 I will be pairing acrylics with gemstones such as Onyx and of course lots of sterling silver. I am off to Toronto tomorrow to visit my suppliers….looking for anything unusual that catches my eye. Silver is also on my list and of course there will be time for some personal shopping. And I plan to have lunch with Pablo Picasso at the AGO. It will be a fine day indeed. We are back from a visit to Manitoulin Island. The vintage necklaces in the image were a great find on the way back. Manitoulin is a lovely place – we stayed at the Queen’s Inn in Gore Bay. I loved this building which was built in the 1880’s as a hotel. It was beautifully furnished – we stayed in the Victoria Room. The hostess Susan Mathia was most gracious and the breakfast was a feast. Fresh fruit cup, home made muffins, orange juice, excellent coffee and eggs benedict. No need to eat for the rest of the day. And we were given 2 muffins to take with us – a great snack. Our only sorrow was that we were sitting on the upper balcony our first evening, but alas forgot to get beverages. Wine would have been lovely! We toured the island, and had lunch at Garden’s Gate which is listed as one of the 100 restaurants in Canada which are a great place to eat. There were a few days at our daughter’s cottage in Tobermory, with wonderful weather for our entire trip. 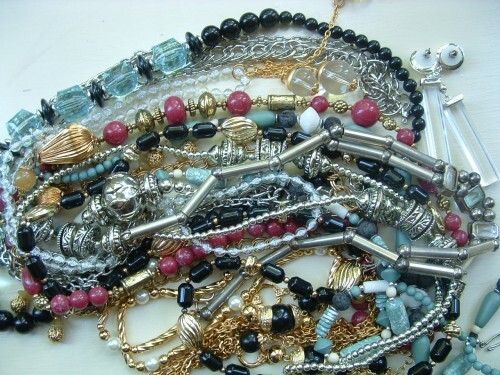 But I must say that I am anxious to get started designing and to incorporate pieces from the vintage necklaces that I found.